June 15, 2008 by Alphageek in "alphageek bourbon golden griddle syrup corrados"
In a strange turn of events, a Crackpot Theory may have evidence to support it. The Theory goes that the Alphageek only liked Golden Griddle syrup as a child, because it was more expensive. 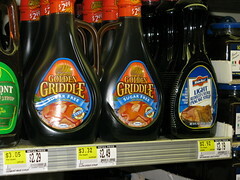 While there is no clear correlation between taste and price that has been established, this picture shows Golden Griddle syrup on the shelf at Corrado's in Clifton, NJ. This picture clearly shows that Golden Griddle is the most expensive in the picture. The Alphageek wishes to point out that this is not the original Golden Griddle, but some sort of weak sugar substitute imitation. "alphageek bourbon golden griddle syrup corrados"